Congrats to Joe Veinot, DCI.now giveaway winner! Congrats to Joe Veinot of Clinton, N.Y.! Veinot is the winner of the first DCI.now fan appreciation giveaway, available ONLY to DCI.now subscribers. His e-mail was randomly chosen yesterday, and he gets a 2003 World Championships T-shirt. 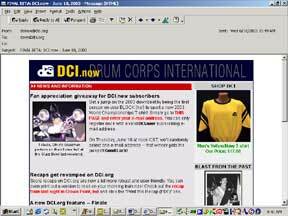 DCI.now is the FREE weekly e-newsletter of DCI.org, and it spotlights every company front, drum break and final push of the drum corps universe. DCI.now comes out every Wednesday, and fan appreciation giveaways like this one are a weekly feature. Sign up now!